Matching up with the requirements of our clients, we are involved in offering Multiwall Polycarbonate Sheet. Alfeni offers Turnkey Solutions for Design, supply and installation of Steel Structure with Glass / TUFLITE range of Energy Efficient Transparent, Translucent and Opaque range in Polycarbonate & UPVC roofing sheets. Sapphire is into many business orients other than poly carbonated sheets such as garments, home textile exports quality goods for giorgio armani etc. For europe. 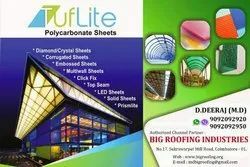 Tuflite Architectural System is a patented system using latest technology in this field. 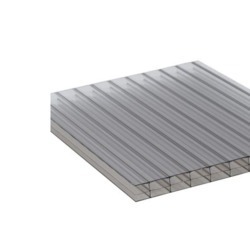 The multicell structure of the panels have been designed with unique jointing systems either with top connectors in polycarbonate or self supporting steel bottom connectors to provide an excellent glazing systems for roofs and walls.